Sego lily; photo by Maylett on Wikipedia (use permitted with attribution / share alike). Blooming in early summer, the sego lily has white, lilac, or yellow flowers and grows on open grass and sage rangelands in the Great Basin of Utah. The sego lily was chosen as the flower symbol of Utah because of its natural beauty and historic significance (the soft, bulbous root of the sego lily was collected and eaten in the mid 1800's during a crop-devouring plague of crickets in Utah). 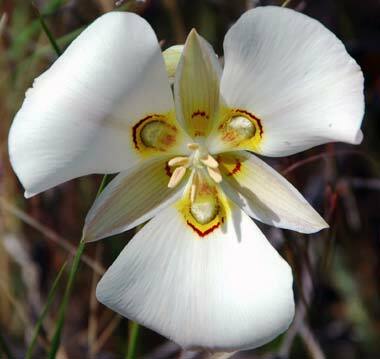 Also called mariposa lily, the bulb of the sego lily was roasted, boiled, or made into a porridge by native Americans before the Mormon pioneers. The sego lily is native to a number of western states (including Idaho, Montana, Wyoming, North Dakota, South Dakota, Nebraska, Nevada, Utah, Colorado, Arizona, and New Mexico). Painting of sego lilies by Mary E. Eaton from Wikipedia.org.